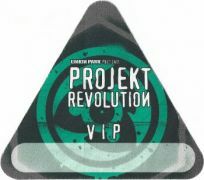 Projekt Revolution 2002 was Linkin Park's first edition of Projekt Revolution and was Linkin Park's first ever headlining arena tour in The United States. It was also Linkin Park's last tour in support of their debut album, Hybrid Theory. The tour ran from late January and ended in late February consisting of 21 shows. Linkin Park ended 2001 by playing two shows in Universal City, CA for Almost Acoustic Christmas. 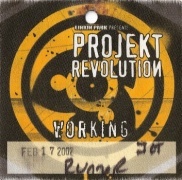 Coming off the most successful year in the band's history (2001), the band took a few weeks to prepare for Projekt Revolution in late January of 2002. During rehearsals for the tour, Mike had this to say to the fans, "Hi guys. 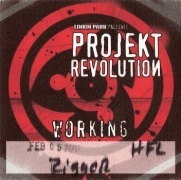 Today is the first day of rehearsal for projekt:revolution. We took a break for the holdiays, and to write some new stuff. We're not going to play any of it yet, but we will be doing some cool stuff at the shows. Its very exciting to be coming back to a lot of the cities that we haven't been to since this time last year. At this point, i'm most excited about the DJ battles we're hosting. At every show, two local, unsigned DJs will be facing off to win a trip with the band to play with us and KORN in mexico city, in front of 40,000 people. and the judges will be YOU -- we're putting live audio from the winner of each night online, for you to vote on and you will choose who best DJ is overall. The winner of every night gets a little gift from vestax. anyway, see you at the show, and LP underground members: don't forget to bring your membership card." The band switched the setlist up a little bit during the course of the tour. For the first six shows of the tour, And One was part of the set each night. However, the song was dropped at the seventh show of the tour in Wilkes-Barre, PA and has never been played since. The setlist also featured a cover of the Deftones song My Own Summer, which Linkin Park said they used to jam to at rehearsals in their earlier days. Since we do not the set information for each night of the tour, there is no way to technically know how many times each of these songs were played on the tour. The Detroit, MI stop of the tour was long rumored in the LP fanbase for having Eminem & D12 come out on One Step Closer. However, it has never been proven, or denied, so there is no way to know for sure. Although, through years of extensive researching, is believed that this performance never happened. The band held a DJ battle contest on the tour, where prominent DJs from certain cities would "battle" at preliminaries and the winner would get to play in between Cypress Hill and Linkin Park on the tour. 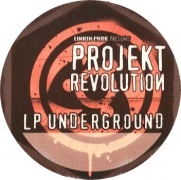 One of the DJ's featured during this named DJ Focus has become a name in the LP community, because a vinyl entitled "Projekt Revolution Breaks" from 2002 surfaced online years after the tour ended and featured a lot of Linkin Park samples and mash-ups, etc. Contrary to popular belief, another rumor was that Mr. Hahn hosted a DJ battle against Z-Trip at the Philadelphia, PA stop of the tour. This never actually happened. During the Fort Worth, TX stop of the tour, someone let off a fire cracker in the pit during the show, which caused Linkin Park to stop playing and kick the person out. It is reported that Mike cursed more than he ever has at any Linkin Park show in history because of the incident. The band had to stop songs twice at the show in Phoenix, AZ because of rowdy fans and the crowd was getting out of control. Further more, Chester had to stop Runway three different times at that show in Long Beach, CA because fans were too out of control. This continued at the rest of the shows on the tour, the worst incident being in Las Vegas, NV on the final stop of the tour. A lot of fights occurred at the show in the crowd. A few of the fights ended up with drunken men running through the floor, some ended with others falling off the balcony area and onto the floor, others ended with the members just being thrown into the floor. After one of the songs, Chester thanked the security guards, to which the crowd responded with a prompt chorus of boos. 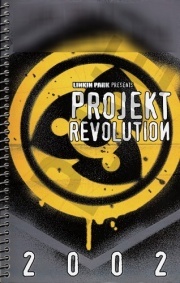 Since it was the last show of Projekt Revolution 2002, Chester invited every person from every band on the tour out to join them for the end of One Step Closer. He also asked the roadies to come out. Members of Cypress Hill came out on One Step Closer at various shows of the tour. Marky Chavez from Adema came out on One Step Closer at various shows of the tour. Z-Trip came out on It's Goin' Down at various shows of the tour. Riff Raff also came out on the song at various shows, alongside Z-Trip. The X-Ecutioners came out on It's Goin' Down at the Long Beach, CA stop of the tour, as well as the San Diego, CA stop of the tour. Originally, Linkin Park had wanted Korn to join the tour, but scheduling did not allow for it. Instead, Korn joined two years later for Projekt Revolution 2004. Chester had this to say about the tour and the touring bands, "What makes this tour great is the collaboration of the heavy guitars and drums along with the hip-hop. B-Real from Cypress Hill also had this to say about the tour. Not only are you getting Linkin Park, a band that does the fusion of hip-hop/metal stuff, you got Cypress Hill that's hip-hop and dabbles with the metal. So we cover all bases." Adema had to cancel their shows in Lowell, MA, Fairfax, VA and Philadelphia, PA due to a family emergency. There were shows announced in Little Rock, AR and Albuquerque, NM for the middle of the tour, but these shows were later canceled and shows in Memphis, TN and Phoenix, AZ, respectively, were added in their place. This was just a small re-routing of the tour before it began - the same thing happened with the North American Arena Tour for Meteora in 2004. The band released several tracks from the San Diego, CA stop of the tour on the Somewhere I Belong CD single. The tracks were Step Up and My December. There are also various videos from the tour available, one being One Step Closer from the Colorado Springs, CO stop of the tour shown on MTV, as well as My December from the Valley Center, KS stop of the tour, which was released a video on LP Underground. After the last show of the tour, Linkin Park flew to Mexico City for their first show ever in Mexico. 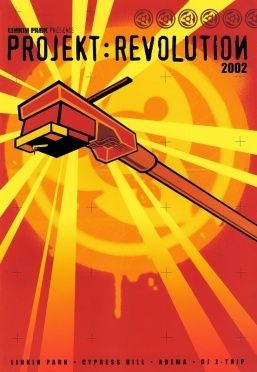 They would not return until 2012, over ten years later. This was a show at Foro Solo for over 60,000 people, opening for Korn. The setlist at this show was just twelve songs...dropping It's Goin' Down, Forgotten, and My December. Two days later, Linkin Park played a benefit concert planned by Los Angeles-area teens for Los Angeles' first pediatric hospice. The "Young Angels Concert," to benefit the city's TrinityKids Care, was open only to students and their families, with tickets starting at $85. Admission included a buffet dinner, while all proceeds went to the hospice. The concert was a fulfillment of a community service project by a dozen 13-year-olds from the Mirman School in West Los Angeles. It was held at the House of Blues in West Hollywood.